Here are some tips to stay healthy and fit during the holiday season. Make a plan and stick to it.Schedule fitness during the week so it does not go to the wayside amid the holiday parties, potlucks, shopping trips and end of year gatherings. By planning out the week and writing it down, you are more likely to actually commit to exercise or the gym. Got holiday travel plans? Look for hotels that have workout rooms and lap pools as part of their amenity package. Sign up for a race.Cities host plenty of Turkey Trots, Gobble Jogs, Santa Dashes or Jingle Jogs throughout the season. Whether it is a 5K or 10K, set a goal to walk or run in an organized race. Not only does it give you something healthy to do, but it creates memories for the whole family, too. Embrace fitness technology.Download a running app. Use a food diary app to keep track of everything you eat and drink, along with your daily calorie intake. Catch a yoga class on YouTube. Set a goal to reach 10,000 steps a day with a pedometer. Download a workout from your favorite fitness guru on social media. With a smartphone, fitness is accessible anywhere and any time. Get enough sleep.Sleep is paramount to committing to that holiday fitness routine. Adults, between the ages of 26 to 64, should aim for seven to nine hours of sleep per night.2That way, after a glorious eight-hour snooze session, you can crush that morning workout at the gym. Take advantage of seasonal activities.Go ice-skating. Embrace sledding down the slopes with your kids. Go snow skiing. Hit the trails with a pair of snowshoes. If you’re traveling, embrace the local outdoor adventures, or just get out and sightsee on foot. 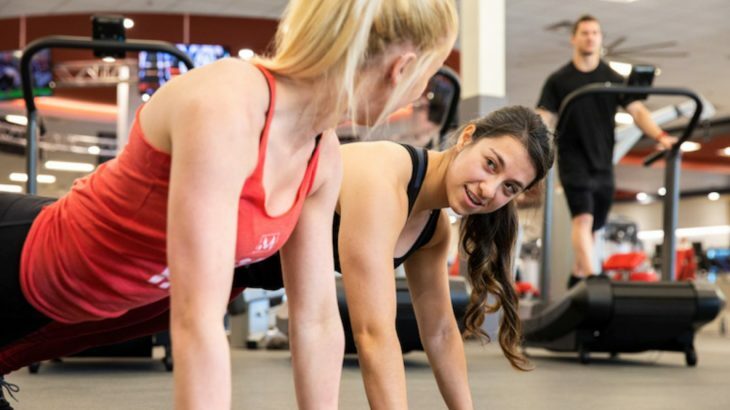 Find a buddy to help stay on track.Schedule workouts with a friend throughout the holiday season. You will not want to disappoint your friend by not showing up so it makes you both accountable. Plus, it makes the workout go by quicker through conversing with a friend while getting your sweat on. Wear running or walking shoes when possible.These come in handy when you can sneak in a quick 20-minute jog or take brief walks throughout the day. If you are traveling, make it a point to always pack running shoes and exercise clothes. You never know when the opportunity may strike for running, hiking or strength training.